The roof of your home is designed to protect you from weather outside. The wind, rain, snow, and ice can come pounding down on it but a good roof will protect you and your family. When it’s time for replacing your roof it’s important that you use a fully qualified roofing contractor such as Livingston Roof Pros. At Livingston Roof Pros we offer roof replacement in Brighton Michigan to protect your home and family. We been a part of this community for some time and we are one of the top roofing contractors in Brighton Michigan. 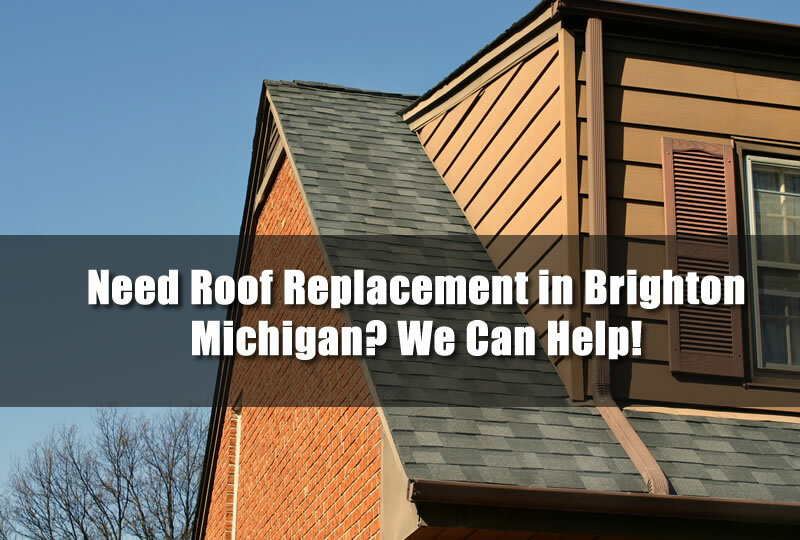 I’ll outline some of the reasons why we are the best and what options you will have for roof replacement in Brighton Michigan. Don’t be fooled with fly by night roofing companies that are here today and gone tomorrow. Put your trust in the number 1 roofing contractor in Brighton Michigan and surrounding areas. We’ve been serving the great folks of Brighton Michigan for over two decades and our work basically speaks for itself. From small roof repairs to full roof replacement in Brighton Michigan we can help give you the roof you need at a price you can afford. We have insurance specialists on staff to discuss ways that your roof may be covered and also ways to get reductions on your home insurance because of a new roof. Want to learn more, please call use today at (517) 940-8770 for more information. One of the biggest problems with getting a low quality roofing contractor to install your new roof is that it may void the warranty on the roofing materials. Roofing material manufacturer have strict guidelines on how the materials should be installed and even offer certifications to roofing contractors to learn and get certified. Using a roofing contractor that isn’t certified could leave you without a warranty on your new roof which is very bad. At Livingston Roof Pros however we hold certifications in all the roofing materials we install from the manufacturers. So the roof we install on your Brighton home will be correct and done to manufacturer’s specifications. We’re also fully licensed, insured, and bonded roofing contractor in Michigan. We aren’t a fly by night company and we’re here to gain your trust and business by offering great roofing service at affordable pricing. When installing asphalt shingle roofing there are different methods that can be utilized for the roof replacement. At Livingston Roof Pros we can accommodate either method of roofing. The first is called re-roofing in which a new layer of asphalt shingles are placed on top of the existing roof. While this is more economical there are some drawbacks which your roofing contractor may explain during the estimate. For full roof replacement in Brighton Michigan which includes removing the old roof before installing the new roof we can also do that. We’ll discuss these options in more details with you during the estimate on your home’s roof which may include both methods of roof replacement. Sometimes re-roofing is not allowed on some homes in the area. We’ll discuss these options in more details with you during the estimate on your home’s roof which may include both methods of roof replacement. Sometimes re-roofing is not allowed on some homes in the area. The way your yard looks before we arrive will be the way it looks after we arrive. We’ll clean up and remove any bits and pieces of roofing that may have mad their way into your yard. We’ll also use a strong magnet to go over the area to ensure there aren’t any stray nails that may have made their way onto your lawn. Once the job is complete you will have a new roof installed without any debris from the old one left around. In order to learn more about our services and to get a free roofing estimate on your home’s roofing repair or roof replacement in Brighton Michigan be sure to call us at (517) 940-8770. We’ll gladly give you an estimate on roof replacement for your home. You can also fill out the form on the right side of page for an online consultation as well.